You are most likely not one of the favored few who have been invited to take Google’s new social networking platform out for a spin and neither am I, but now we get a glimpse of what Google has been up to. When it does go live, Google+ will open a new front in the battle against Facebook, and one that appears more promising than the ill-fated Google Buzz. 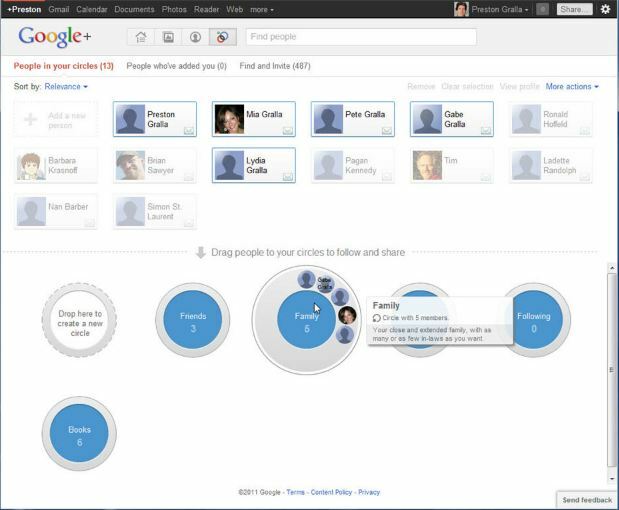 The Google+ experience is in large measure reminiscent of Facebook with at least one major exception: Circles. Facebook’s glaring weakness is its insistence that you indiscriminately present the same persona to every one of your “friends,” a list which may include your best friend from childhood, your ex-girlfriend, your boss, your co-workers, your grandmother, and that kid that lived down the street when you were growing up. Amusingly, Zuckerberg turns moral philosopher on this point and declares that maintaining more than one online identity signals a lack of integrity. Google+ more sensibly assumes that not all human relationships are created equal and that our social media experience ought to acknowledge that reality. It allows you to create Circles into which you can drag and drop names from your contact list. Whenever you post a picture or a link or a comment, you may designate which Circles will be able to see what you have posted. In other words, it lets you effectively manage the presentation of your self to your multifaceted social media audience. Google+ appears to have thus solved Facebook’s George Costanza problem: colliding worlds. Facebook has gestured in this direction with Groups and Friend lists, but this remains an awkward experience, perhaps because it is at odds with the logic at the core of Facebook’s DNA. Google+, having taken note of the rumblings of discontent with Facebook’s at times cavalier attitude toward privacy, also allows users to permanently delete their information from Google’s servers and otherwise presents a more privacy-friendly front. Even with these features aimed at exposing Facebook’s weaknesses and recent news about kinks in Facebook’s armor, Google+ is not expected to challenge Facebook’s social media supremacy. Inertia is the main obstacle to the success of Google+. Many users have committed an immense amount of data to their Facebook profiles and Facebook has worked hard to integrate itself into the whole online experience of its users. Additionally, Facebook has more or less become a memory archive for many of its users and we don’t easily part with our memory. Most significantly, perhaps, Google+ starts from a position of relative weakness as far as social media platforms are concerned — it has few users. Most people will, for a long time to come, more readily find those they know on Facebook. That said, Facebook’s early success against Myspace was predicated on a certain exclusivity. It may be that an early disadvantage — relatively few members — may present itself as an important advantage in the eyes of enough people to generate momentum for Google+. It is also hard to tell how many would-be social media users have been kept at bay by Facebook’s shortcoming and will now venture into social media waters given the refinements offered by Google+. Casual Facebook users may also find it relatively painless to make a move. Hard to tell from here, as is most of the future, but I wouldn’t be too surprised if Google+ significantly eroded Facebook’s base. Despite, my Highlander-esque title, the most likely outcome may be that both platforms co-exist by appealing to different sets of sensibilities, priorities, and expectations. The privacy and the ability to compartmentalize information is a good mirror of real life – and I like it! Impatiently waiting so we can invite more people! While google+ is very nice if they continue the field testing for much longer they risk killing it before it launches. i am on the site at the moment and most of the other people I know that are on the site are already bored with it – as there is nobody else to interact with! There is a serious risk that the userbase they are strating with i.e. people like me who had an invite will be bored with it by the time it launches properly and therefore they will have an uphill struggle to get us interested again. It is definately a better set up than Facebook but if nobody is onboard then it’s like being in a swanky empty pub while your mates are all in the dump next door. You might have a better seat but they are having the good time. Good point and nice analogy.